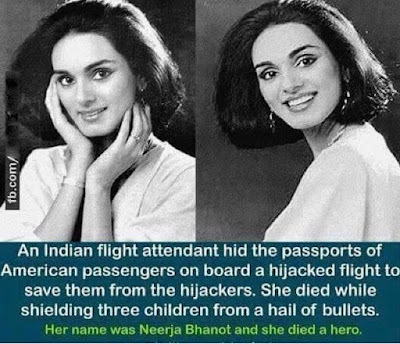 7th sept. Today would have been Neerja's 53rd birthday, but PAN AM Flight Attendant Neerja Bhanot of Chandigarh, India died at 22 on September 5, 1986- just days before her 23rd birthday - being a hero. She is credited with saving the lives of 361 passengers onboard PAN AM 73. When radical Islamic terrorists hijacked her plane in Karachi, Pakistan she informed the pilots (who used their escape hatch to runaway) and kept both the passengers/remaining crew calm. When the terrorists demanded to know who the Americans were on the flight so they could execute them she gathered all the passports and hid the ones belonging to Americans under seat cushions. The terrorists confused and unable to determine the national origins of the passengers executed one person and singled out a British passenger (Mike Thexton). When the terrorists were starting to running out of ammunition she was able to nearly singlehandedly evacuate all the passengers via a slide. She being one of the last people on board did a last check and found three children still hiding. As she led the children to safety the surviving terrorists spotted the children and opened fire on them. Neerja jumped in the way of the bullets and was mortally wounded. She was able to evacuate the children to safety before dying from her wounds. 20 people died, 361 survived. Neerja was awarded the Ashok Chakra Award by India, the highest peacetime gallantry award possible. She was the youngest and first civilian to ever be awarded this honor.